’The Child of the Marshalsea’ - Enlarged Dicken’s illustrations mounted on the wall of a Public Library. Little Dorrit exiting the gate of the Marshalsea Prison. Photos of pupils posing in improvised costumes are set into the illustrated pages of Charles Dickens’ novel Little Dorrit (drawn by Hablot Browne aka Phiz). The cut out images were applied to aluminium sheet using encapsulated vinyl. The effect was like a page from a pop up book. Marking the site of the historic Marshalsea Prison, in Southwark, South London. The cover page for Little Dorrit. My interpretation of the title page with two of the pupils in character with improvised costumes and props. 'Society expresses its views on a question of marriage' (Mrs Merdle). One of the pupils of St. Joseph’s School next to her image as Mrs Merdle. In total four scenes from the book were represented. Little Dorrit and her father. The Father of the Marsahlsea. The pages were three dimensional with the figures cut out of the background and the page of text bowed to create a space. The opening was marked by a speech by one of Charles Dicken's great great grand children. Sadly the panels were vandalised and are no more. They were replaced by a flat version of the images placed out of reach. 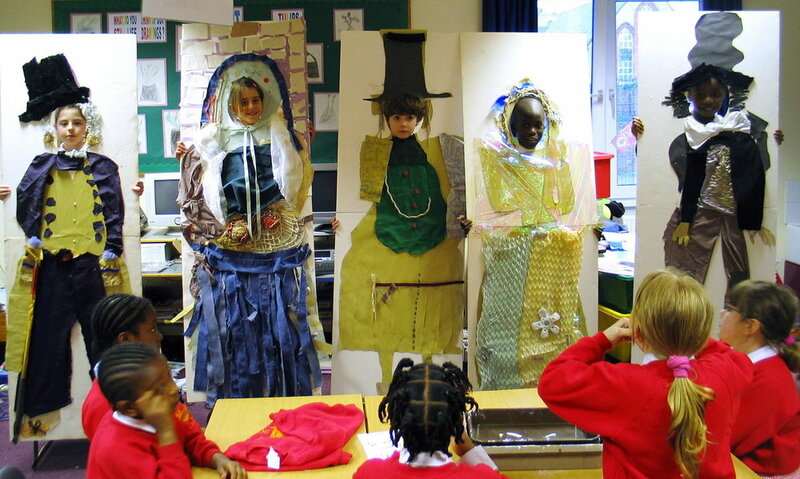 Workshops in a local primary school: children made the costumes of characters from Dickens’ book. The old wall of Angel Place is thought to be that of the Marshalsea prison. Pupils took various rubbings and impressions, comparing the old and new walls of Angel Alley. Drawing from the illustrations to Little Dorrit. Rolled aluminium, printed vinyl and resin. Angel Place, John Harvard Library, London Borough of Southwark, SE1 1JA. Commissioned in 2004 by Bankside Open Spaces Trust and Art in the Park. Working with St. Joseph's Primary School.